Special conference in Knesset on bill to abolish compulsory recruitment by MKs from Right and Left; 'In fact, the army isn't people's army." An unusual debate took place today in the Knesset at the initiative of Knesset members Mossi Raz (Meretz) and Yehuda Glick (Likud) to cancel the draft. The conference was attended by Knesset Members from a variety of parties, academics, army representatives, and civilians. MK Glick, one of the bill's sponsors, said "I'm interested in patriotism and love of the Land. We have a desire for a strong state, but the truth is that today about a third of the Israeli nation don't enlist. If there's a topic that divides Israeli society and doesn't unite it in the past 40 years it's the obligation to enlist. It's appropriate to examine from time to time our basic assumptions. It can't be that what we needed when we were 600,000 people in 1948 doesn't change with 8 million people in 2018." MK Mossi Raz added, "We've already become a semi-professional army and the army understands this very well. Service is getting longer and we're on our way there. The army is a typical social conductive catalyst, and the four lowest tenths of the population rarely enlist, so it's not a melting pot. There are groups that don't enlist and will never enlist - how long will we continue inciting against each other? We offer compulsory recruitment with one exception: Those who don't want to - don't have to. This model will end the conflict between the haredim and the secular that support the haters and allow the State of Israel to deal with its real problems." 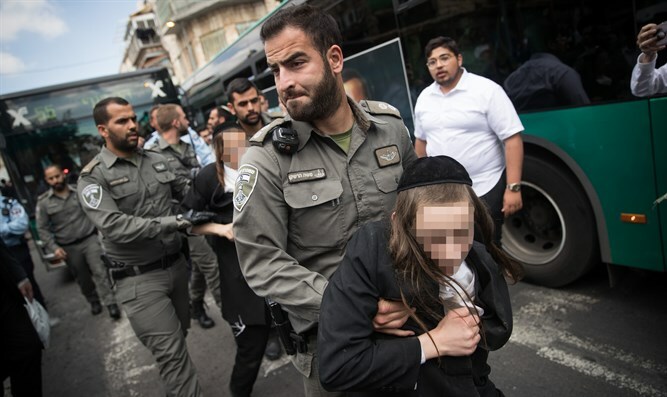 MK Menachem Eliezer Mozes (United Torah Judaism) spoke of the haredim's part: "We know the truth - equality doesn't exist; there's no equality between one who sits on the fence in Gaza and one who serves in the center of the country. The whole issue of equality is an endless debate. Moreover, in which country other than Israel do women have compulsory conscription? North Korea. The secular people don't really want yeshiva students to enlist - they wouldn't recognize their children after three years of service with Torah scholars." Identity Movement Chairman Moshe Feiglin said at the meeting: "The majority of the army agrees on the issue of professionalization. The root of the dispute is not security and not economic, but concerns the general public's fear of losing the tribe's torch. Enlistment to the IDF is the bar mitzvah rite-of-passage to Israeliness. The question is where do we perceive the State in the life of the citizen? There's nothing more harmful to human liberty than forced recruitment."